Summery, boho sweet and simple. Flowing white chiffon dress with halter that ties in back, leaving a dramatic cascade. This dress is very figure flattering, and not meant to fit super tight, so don't worry if your waist is smaller than the measurement-with the empire waist, it is meant to be loose. And the bust is stretched to the maximum when I measured it; if you are a 1/2" to 3/4" smaller than bust size, you will be fine. 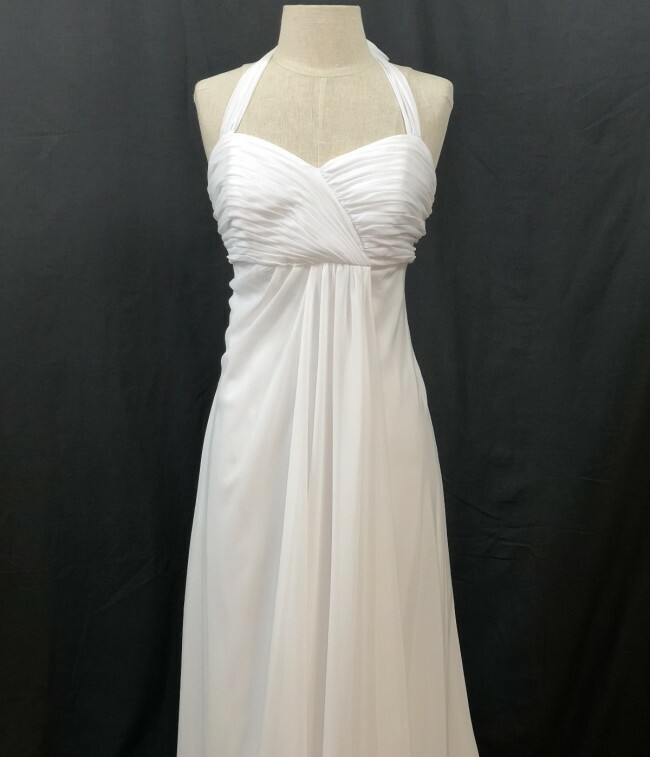 This dress would also be great for a bridal shower, engagement dinner, or any number of bridal events that you will be partaking in :) It is in excellent condition, used for about 3 hours only. Measures 37"x34"x free hips (about 54" as it flares out into an A-Line). Length is 54" from underarm to floor, and back is a few inches longer than front, so there is a very slight train. I am happy to answer any questions, and to ship (almost) anywhere!